Want to work at home and make money from your computer as a blogger? Or just want to start a blog about your life or interests for fun? 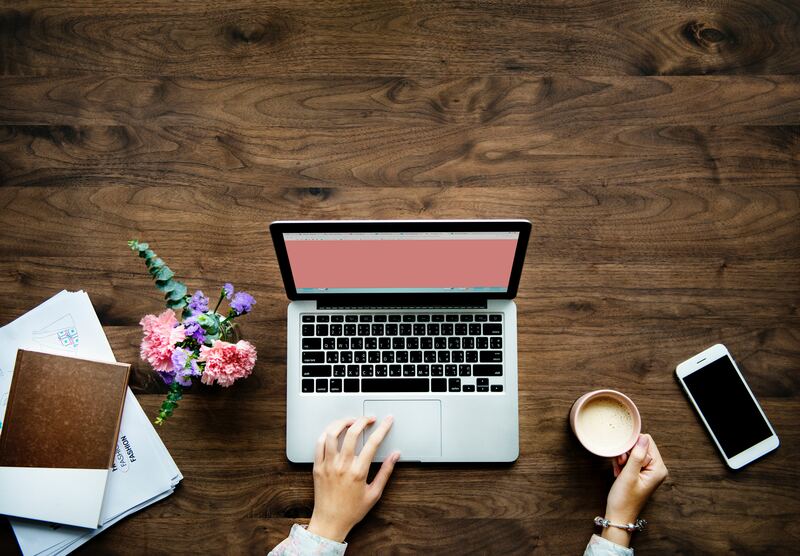 Starting a blog can seem like an overwhelming idea when you don’t know where to start but don’t worry – it’s very easy to set up a new blog in under half an hour, even if you don’t have any technical knowledge or experience in blogging or making websites. Many beginner bloggers are put off at the very first hurdle – choosing a blogging platform. This is because there are so many options to choose from and it can be really confusing trying to decide which is best when you don’t really know what you’re looking for. So how do you know which platform to choose? And why on earth is WordPress on there twice? Essentially there are two options when it comes to using a blogging platform: you can either buy your own web hosting and domain name and install blogging software on it, or you can use a fully hosted service where they take care of most of the setup so all you need to do is customize and write your blog posts. I know what you’re thinking – fully hosted sounds great right? Well it may certainly seem that way if you’re a beginner and many people do start out on one of these platforms, but they also have some pretty significant disadvantages. They offer different themes and customization options so you can make your blog your own. You don’t really own your site or have full control – if the platform goes down or goes out of business, you could lose your blog. Your account can also be suspended at any time. Free services are often branded or have advertising that you won’t make any money from. For these reasons I recommend that everyone starting a blog that they want to take seriously or make money from at some point in the future uses WordPress.org right from the start. I know many people who started out on hosted services and regretted it later when they felt limited by the platform. Yes there’s a bit of a learning curve compared to some other options (but it’s easier than you think!) and you will have to take care of your own maintenance such as backups and security, but you will be in full control of your blog to customize it and grow it as you wish. It’s secure and updated regularly. 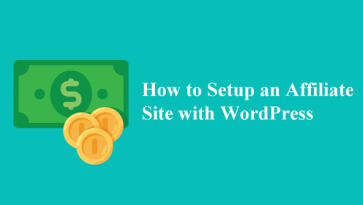 Because WordPress is so much of a better option than the other services, the rest of this guide will take you through the steps you need to follow to make your own WordPress blog. WordPress is software and you need to install it on your computer. While technically you can install it on your own computer, you’d have to leave it online 24/7 and make sure it’s protected against security attacks. 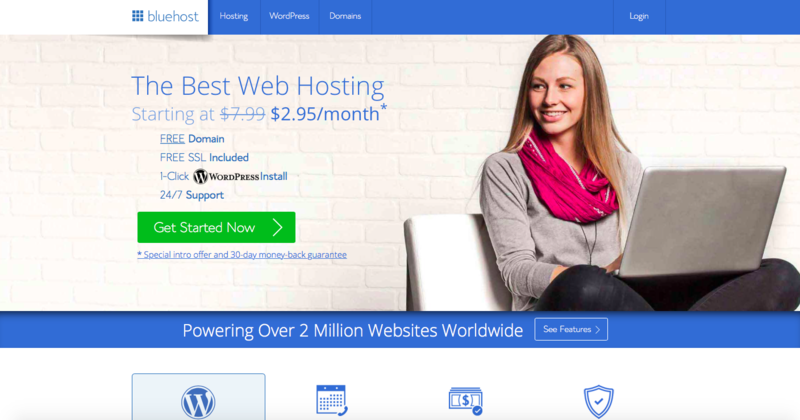 For most people this isn’t practical, so instead you can rent space on another computer that’s specifically set up to serve websites – a web host. You can rent a whole server (computer) but for most people it’s sufficient to opt for shared hosting where one server hosts many other people’s websites too. This is much cheaper than private hosting and you won’t need to upgrade to a private server unless your blog gets really big and has lots of traffic. There are literally thousands of web hosts out there so this can be another stumbling block if you tend to get paralyzed by too much choice. Their hosting service is fast and secure. 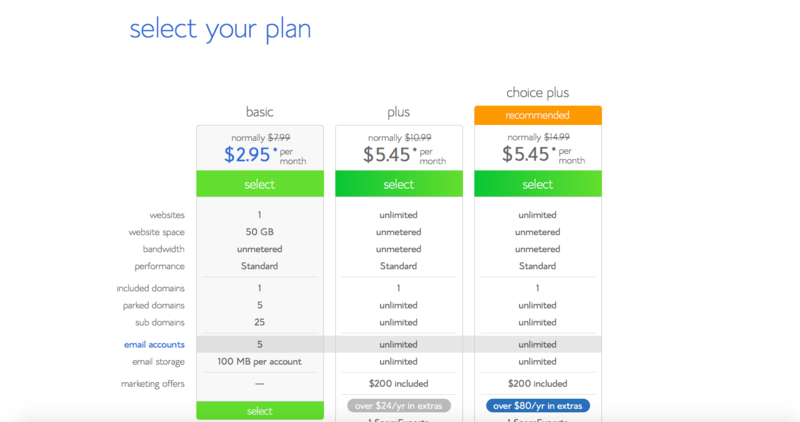 You can then choose your hosting plan. 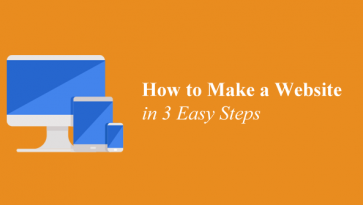 If you’re sure you only want to make one blog, you can go for the Basic package. If you think you might want to set up some more blogs or websites at a later date, it’s worth paying a little more for one of the other packages as they support unlimited sites and web space. 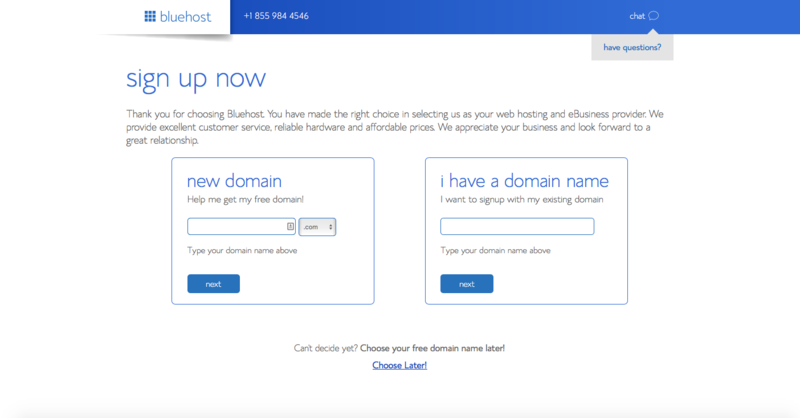 You get a free domain name with each Bluehost package and you can choose it on the next page. If you haven’t already got a name for your blog think of something short and memorable. It’s best to go for a .com if it’s available. 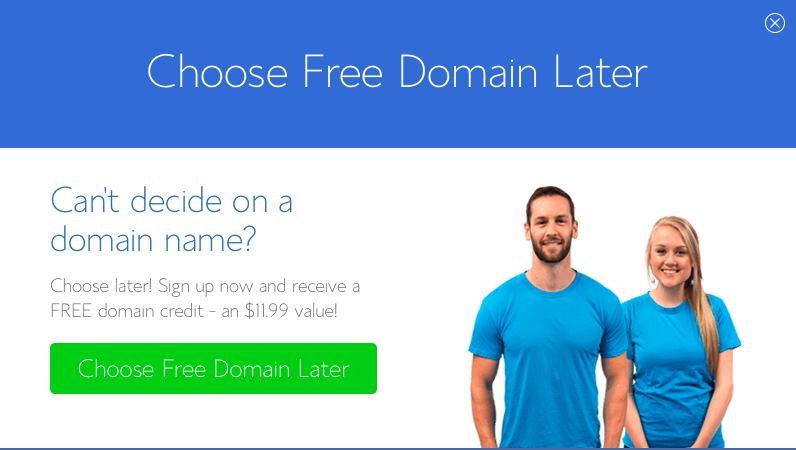 If you can’t make up your mind on a domain name, you can click the bottom of the page to proceed without choosing one and decide on it later. You’ll then be taken to a form to fill out your personal details and payment information. You can also choose the length of your plan (from 12 to 60 months – longer is cheaper) and add extra features such as Sitelock Security and SEO tools if you want them. Once you’ve agreed to the terms of service and hit the submit button, your account will be open and you should be able to access it and start setting up your blog immediately. 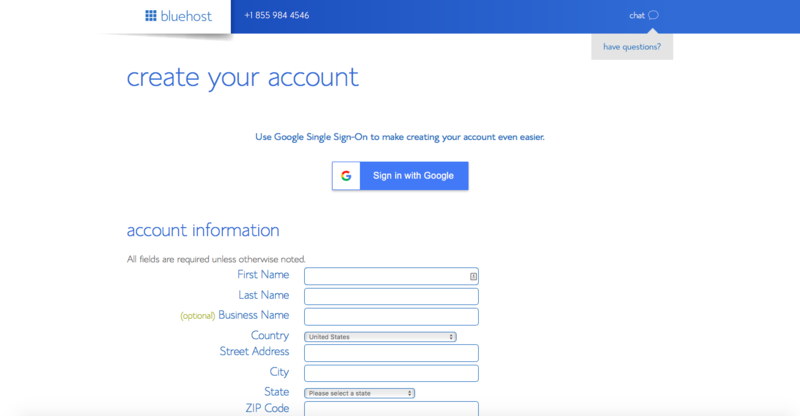 You’ll be sent a confirmation email with your login details. When you log into your Bluehost cPanel account, you’ll see lots of different icons to manage different parts of your webhosting. Scroll down to the “website” section and select “Install WordPress” – click the Install button. Finally, tick the box to say you’ve read the terms and conditions and click the install button. It will take just a couple of minutes for your WordPress blog to be installed. When it’s done you’ll be taken to a screen with a link to the admin page, and your username and password to log into your site (this is different to your web hosting username and password!) You’ll also be emailed this information. 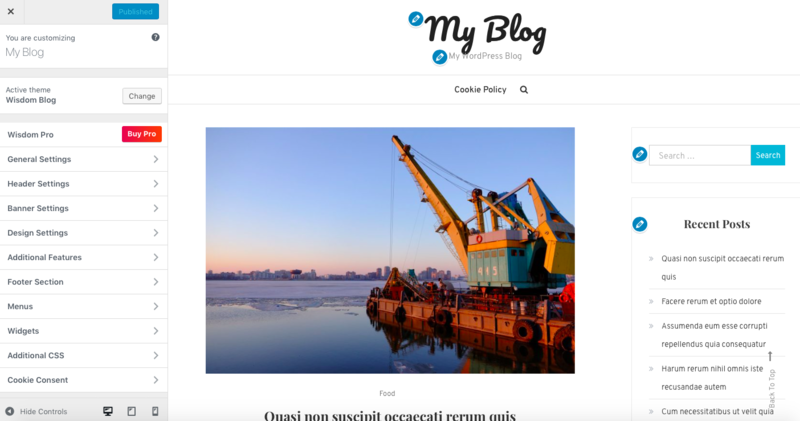 Your new WordPress blog is installed with a basic theme but you’ll probably want to change this to a theme of your choice. 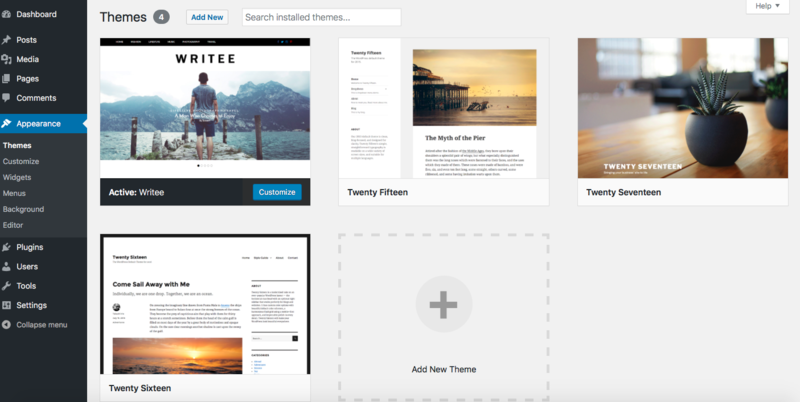 You can then browse or search for free theme from within WordPress. 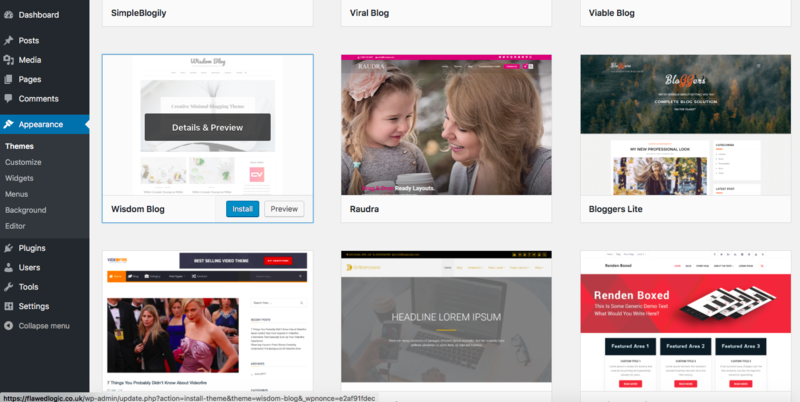 You can even click the feature filter and check “blog” to see all the WordPress themes designed for blogs. This is one way to look for WordPress themes but you can also search online for themes on WordPress.org or in premium directories like ThemeForest. To install a theme you’ve already downloaded, click the “Upload Theme” button. Once you’ve found a theme you like, you can click the “install” button and then the “activate” button to use it on your blog. Most themes let you change things like colors, fonts, logos, and images. To do this go to Appearance > Customize and you’ll see a menu of things you can change. You can preview your changes in real time so you won’t have to keep flicking back and forwards between the blog homepage and your dashboard. Once you’re happy with the design of your blog, it’s time to create some content! In WordPress “posts” are your single blog posts that you’ll create every time you update your blog, and “pages” are static content that you want to make easily available such as your “about” page. You can create posts and pages by going to “posts” or “pages” in the menu and then “add new”. To add a new post, write a title, compose your post in the large text box (the editor is very similar to Word and other word processing software so you should find it pretty straightforward). To add images to your post, click the “add media” button and select the file from your computer. You can also drag images right from your desktop into the composer. You can order your posts into categories to make them easier to browse on your blog. You can click the link to create a new category while you’re creating your post, or just check the box of a category you’ve already created. 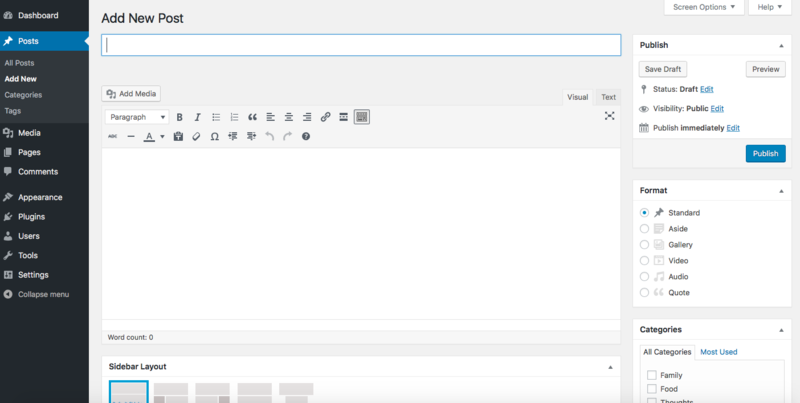 You can find a more detailed guide to creating a post at the WordPress codex. Once you’re finished writing your post, hit the “Publish” button on the top right to go live. If you want to schedule your post for a later time or date, click the “Edit” link next to “publish immediately” and choose a time and date. You now have a nice looking blog with at least one post – congratulations! 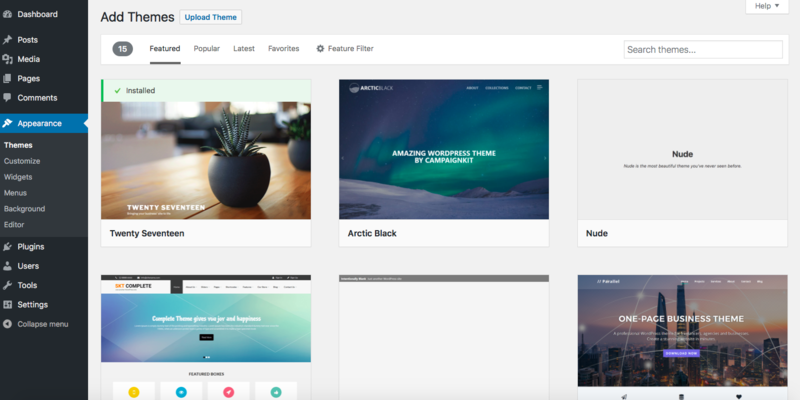 It’s worth taking some time to explore the WordPress interface and experimenting with customization to tweak your design. Plugins is another exciting and useful part of WordPress that can extend the functionality of your site. With plugins you can do things like add an image slider, create forms easily, and add social sharing buttons to your post. 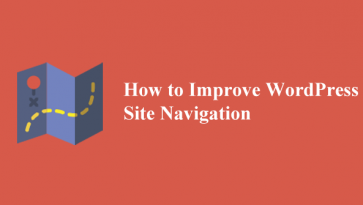 Whatever you want to do with your site, there’s most likely a plugin for it. It’s also worth checking out some of our other tutorials to see all the things you can do with your WordPress blog. Any questions? Leave them in the comments and I’ll try to help!